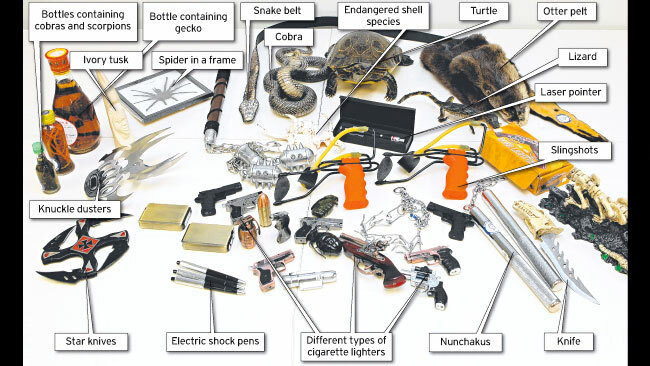 THERE are knives and nunchakus, knuckledusters, imitation guns and grenades, and slingshots that could do their target serious damage. These are just some of the deadly presents that won't be under Christmas trees this year after being seized by Customs in the run-up to the festive season. Officers intercepted a record number of prohibited items, among the weirdest being snake wine, a stuffed baby crocodile, a cobra in a jar, pens that give an electric shock and even a elephant hide diary. Much of the growth in the amount of mail is believed to come from Aussies going online to do their Christmas shopping. "Online shopping is a great way to find unique gifts at a competitive price, but consumers should make sure they are making wise purchases that will be allowed into Australia," Home Affairs Minister Brendan O'Connor said. "Websites sometimes claim that their products can be brought into Australia but this isn't always correct, so it is important to check with Customs before you buy. "Australia applies importation restrictions and bans on some products that are dangerous or illegal," he said. Consumers are warned to be particularly wary when it comes to buying online clothes as these may be counterfeit, replica weapons including toy guns and some ornamental knives, laser pointers and wildlife souvenirs.